BlogMarketing and PromotionWhat is the Buyer’s Journey and Why Should You Care? That’s not us talking — that’s insight straight from McKinsey. The assertion is simple: in this digital age, linear funnels are woefully outdated. Your customers aren’t moving from Awareness to Decision stage. Instead, they are undertaking a complete journey with stops and detours in between. We call this the Buyer’s Journey, and understanding it will give you radical insight into your customers. In this post, we’ll learn how to map the Buyer’s Journey, and create content for each stage in this journey. In a nutshell, the Buyer’s Journey is the steps any customer takes before making a purchase decision. You realized you have a problem and need a solution. In the Buyer’s Journey, this is called the Awareness Stage. After understanding the problem, you researched some possible solutions. We call this the Consideration Stage because this is the point where you start considering answers. After narrowing down your list to one or two solutions, you searched for the best place to buy them. This is the Decision Stage. 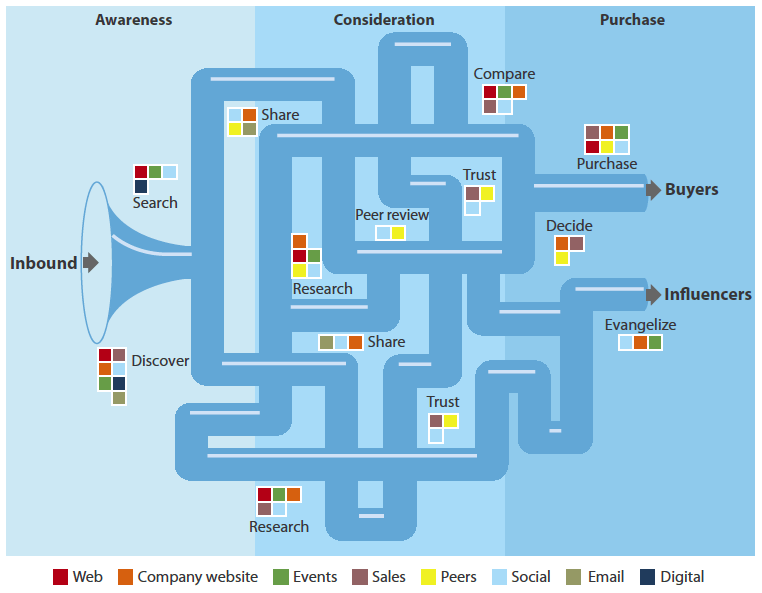 This is the Buyer’s Journey as it was first described in 1968. At that time, it was a relatively simple concept. Customers entered the journey from the Awareness Stage, and exited at the Decision Stage. The entire journey was expected to be linear, with customers moving in a straight path from one stage to another. In truth, the Buyer’s Journey today is very different. Your customers have access to the world’s knowledge at their fingertips. They have no real reason to follow the linear journey described above. They can start the purchase process, spend a few weeks considering solution, then decide not to buy anything at all. Although the three discrete stages — Awareness, Consideration and Decision (or Purchase) — still exist in this journey, customers go through them in a staggered, non-linear fashion. Your buyers might very well start searching for a solution, go through some answers, then give up halfway after being distracted by a new email or Snapchat. Complicated? You bet. At the same time, understanding this journey can help you fulfil the first commandment of marketing: Know Your Customer. 81% of customers research online before making a purchase decision. For B2B buyers, this figure is as high as 94% . Customer leads generated through inbound channels (i.e. pull marketing) are 61% cheaper than those generated through outbound marketing. 45% of companies readily admit that they have no idea how their customers interact with them. These statistics paint a clear picture: your customers are actively searching for solutions online. Whether you can reach these customers when they search for answers will play a big role in your success. This is where the Buyer’s Journey comes into play. If you can map this journey, you can create content that will place you front and center when customers look for solutions. This way, instead of pushing your products, you can successfully pull customers in by helping them through each stage of the journey. Insight: You understand your customers and their needs better. Brand Building: By providing valuable content for each stage of the Buyer’s Journey, you can position yourself as a useful, authoritative brand. Lower Costs: Leads generated through inbound channels such as SEO and content marketing have a higher ROI than those through outbound channels. Map out the routes a buyer might take through the Buyer’s Journey. Create content for each route through this journey. We’ll show you how to accomplish this below. 81% of customers search on Google before making a purchase decision. Put another way, it implies that 81% of your customers go through at least some stages of the Buyer’s Journey through their searches. If you remember your SEO 101, you also know that different keywords are associated with different customer intentions. A customer who searches for a how to is more interested in understanding a problem and its solutions. One who searches for long-tail reviews or coupons keywords, on the other hand, is likely close to purchasing a solution. Which is to say, if you have a list of keywords, you can segregate them into different categories depending on searcher intention. These categories roughly correspond to the three stages in the Buyer’s Journey. Suppose you run an online store selling laptops. A buyer lands on your site by searching for new Windows laptops on Google. Here, he finds a blog post about recently launched laptops. From this blog post, he makes a list of different laptops offered by different brands. Because he’s heard a lot about Dell, he decides to focus his search on Dell laptops. He types in new Dell Windows laptops and finds a list of Dell laptops. He looks at their prices and realizes the Dell 7000 Series would be perfect for him. Now that he’s made a choice, he needs validation. His next search is for Dell 7000 series laptop reviews. This query takes him to your blog where he finds an in-depth review. Finally, after deciding that this is the right laptop for him, he wants to find the best deal for it. He types in Dell 7000 series laptop coupon codes. After finding a coupon code, he searches for buy Dell 7000 series laptop online. Your site shows up as one of the results. He recognizes your website name because he’s had multiple positive interactions with your brand before. Because of the positive brand equity you’ve built up, you end up making a sale. These keywords become progressively more targeted as the buyer goes from not knowing anything about the topic to searching for a particular laptop model. By creating useful content for each of these Buyer’s Journey keywords, you’ll ensure that you retain top of mind brand awareness among your customers. Instead of just being another no-name retailer, you can be known as a brand that helps buyers throughout their buying process. If you can build the platform where you become the trusted expert. If a company had more people thinking about that instead of focusing on the product, it would open up all kinds of opportunities. The process for mapping the buyer’s journey with keywords is fairly simple — get a list of keywords, then divide them into different stages depending on what kind of questions they pose. The awareness stage is all about helping the buyer understand his problems better. Keywords that go into this stage usually answer broad, problem related questions. For example, if you were selling a WordPress caching plugin, improve WordPress speed would be an awareness stage keyword for you. It’s broad and assumes no buyer knowledge of any caching solutions. Plug it into your keyword tool to get lots of content ideas. Example: PCMag helps buyers find new laptops through list-based blog posts. By the consideration stage, the buyer knows more about his problems and some of the solutions. Keywords that go into this stage either explore a problem in-depth, or help buyers list out possible solutions. For a WordPress caching plugin, wordpress caching tool reviews would be a consideration stage keyword. The buyer knows that caching is one solution to his WordPress speed problem, and is now looking at all possible solutions for it. Example: After helping them find new laptops, PCMag also helps buyers decide what to buy through reviews. The review also includes an affiliate link to a retailer. Place keywords that help buyers compare solutions or review a particular product into the decision stage. For example, after looking at all possible caching plugins, a buyer might have two competing solutions — WP Super Cache and W3 Total Cache. To make a final decision, the buyer might search for a keyword like wp super cache vs. wp3 total cache. Example: Since PCMag is not a retailer, it does not rank at the top of the page for this keyword. This position is occupied by an E-commerce store, Amazon. As you can see, our keywords became more targeted as we advanced from the Awareness to Decision stage. The final step is to create content for each of these keywords. If you’ve followed the above steps, you should have a list of keywords mapping out different stages in the Buyer’s Journey. You work, however, is only half done. To actually put this data to good use, you need to start creating content for each keyword in the Buyer’s Journey. It’s great for SEO. Lots of keyword focused, helpful content = higher search engine authority. Perhaps this is why 84% of marketing execs say that plan to map content offers to buyer journey stages. To create targeted content, start by listing out each keyword in each stage. Then brainstorm content ideas, indicating the content type (blog post, infographic, social media post, etc.) next to it. Does this keyword support my chosen content type? For example, the keyword how to install a WordPress plugin does not have the depth to support an eBook. It can, however, work very well as a blog post. Does the content type match the buyer’s journey stage? An in-depth whitepaper, for example, would be overkill when offered to buyers in the awareness stage. Is the keyword targeted enough for the content? Some keywords are too broad for a single content offer. In such cases, consider dividing the keyword across multiple content offers. For example, optimize WordPress can be divided into a blog post on common WordPress optimization hacks, and an in-depth technical whitepaper on changing server configurations to improve WordPress performance. Once you have this list of keywords along with the target content, it’s time to get cranking and push out content to help your buyers make better decisions! Understanding the Buyer’s Journey should be a top priority in any successful digital marketing endeavor. Not only can it reveal incredible insight into your customer behaviour, it can also help you sell more by building up your brand and increasing your reach. The Buyer’s Journey describes all the actions a buyer takes before purchasing a product. The Buyer’s Journey helps you understand your customers. You can map this journey through keyword data. You can increase your search engine reach and build your brand by creating content for keywords in the Buyer’s Journey.